— This article by Matt Elenniss¹ and Jerry Cates², first published on 2 January 2012, was last revised on 22 June 2013. © Bugsinthenews Vol. 13:01(02). 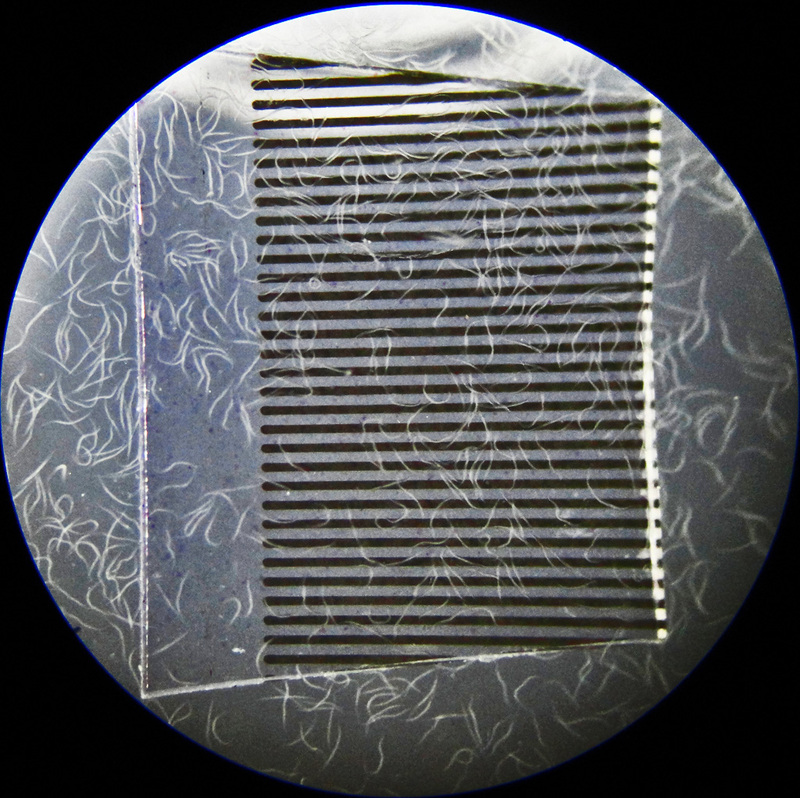 Beneficial entomopathogenic nematodes (EPN) are commonly used, today, as biological agents to exterminate pest insects and their larvae. EPN are referred to as parasitoids because they kill the insects (the hosts) they invade rather than parasitize them. Their mode of action in this regard has the character of an invasive “trojan horse”, in that they bring with them a bacterium — symbiotic to EPN, pathological to their insect host — tucked away in a specialized vesicle within the EPN gut. On entering an insect host, the EPN discharges its bacterial symbiont into the host’s circulatory system. There the bacteria rapidly multiply, excreting (1) toxins that kill the host, and (2) antibiotics that prevent putrefaction of the host’s tissues. The EPN then feed on the bacteria and the host’s nutrients, become sexually mature, and reproduce through several generations. Nutrient reserves inside the insect host are quickly depleted by the rapidly multiplying nematodes and their bacterial symbionts. 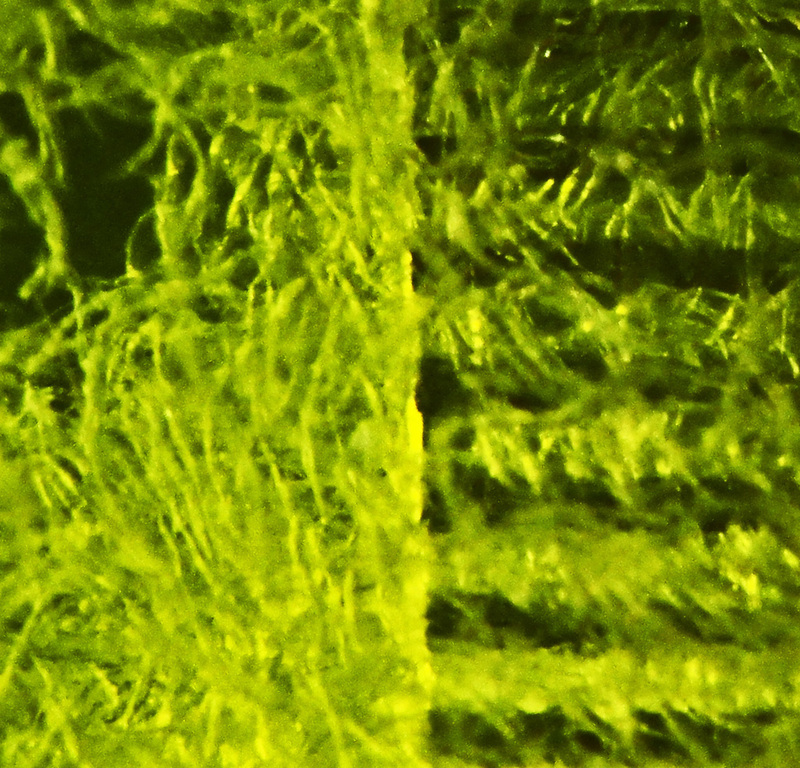 As host nutrients near exhaustion, a portion of the EPN revert to the infective juvenile (IJ) lifeform, replete with an internal vesicle of symbiotic bacteria. The IJ’s eventually break through the outer skin of the insect’s corpse, whereupon they begin searching for new insect hosts. Much remains to be learned about the interactions between EPN and various pesticides, particularly the non-toxic and least-toxic pesticides such as sodium borate (which is applied in a number of different formulations). Those attracted to EPN because they are non-toxic to humans and their pets are also attracted to least toxic pesticides, like the sodium borates, as an adjunct to the application of EPN and similar biological pesticides. Such adjunctive usages are intriguing, particularly if the combination of EPN and one or more of the available least-toxic pesticides complement one another in terms of their overall effectiveness.. This begs the question of how toxic each of the least-toxic pesticides are, relative to the different families, genera, and species of EPN, and to the variety of bacterial symbionts that such EPN carry in their intestinal vesicles. 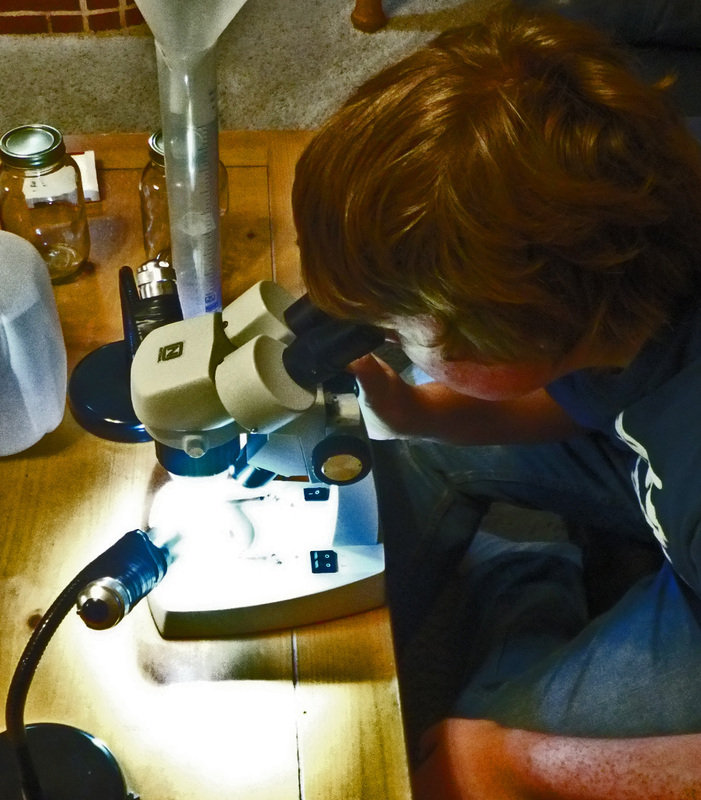 This article describes a scientific analysis, designed and carried out by Matt Elenniss (a high school freshman biology student in Cedar Park, Texas), of the interaction between a popular EPN, Steinernema carpocapsae, and a common mineral-based low-toxicity pesticide, disodium octaborate tetrahydrate (DOT). 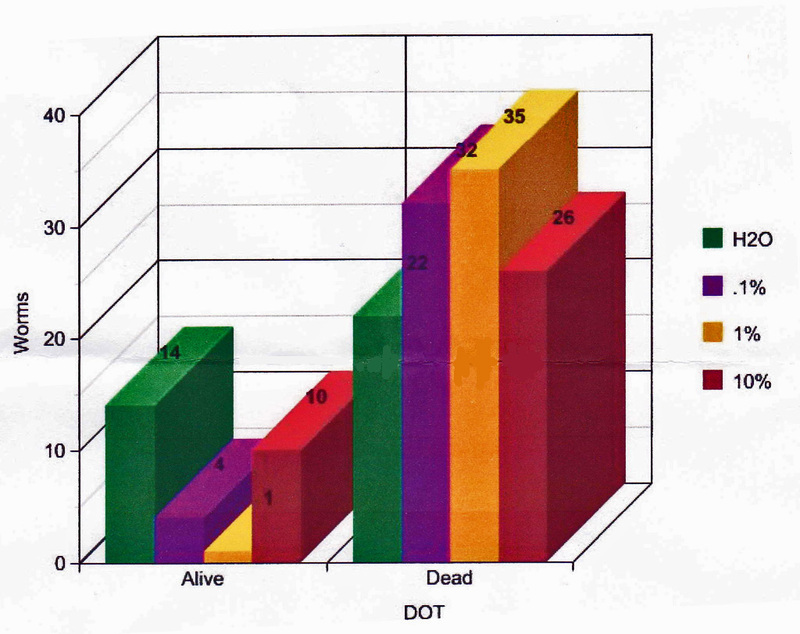 DOT has a low mammalian toxicity but is widely used to control fungi, termites, ants, and other insects. Mr. Elenniss’s study investigates the vigor of the EPN species Steinernema carpocapsae and its bacterial symbiont Xenorhabdus nematophila, comparing the virulence of untreated EPN controls with that of EPN treated with varying concentrations of DOT in distilled water, when the EPN are applied to living larvae of the wax moth (Galleria mellonella) and a species of darkling beetle (Tenebrio molitor). A paper on this study was finalized by Mr. Elenniss and submitted to his biology professor, Lee Brown, on 2 February 2012. That paper is reproduced below, exactly as submitted, along with a review by Jerry Cates, who advised Mr. Elenniss during the experimental phase of the project. 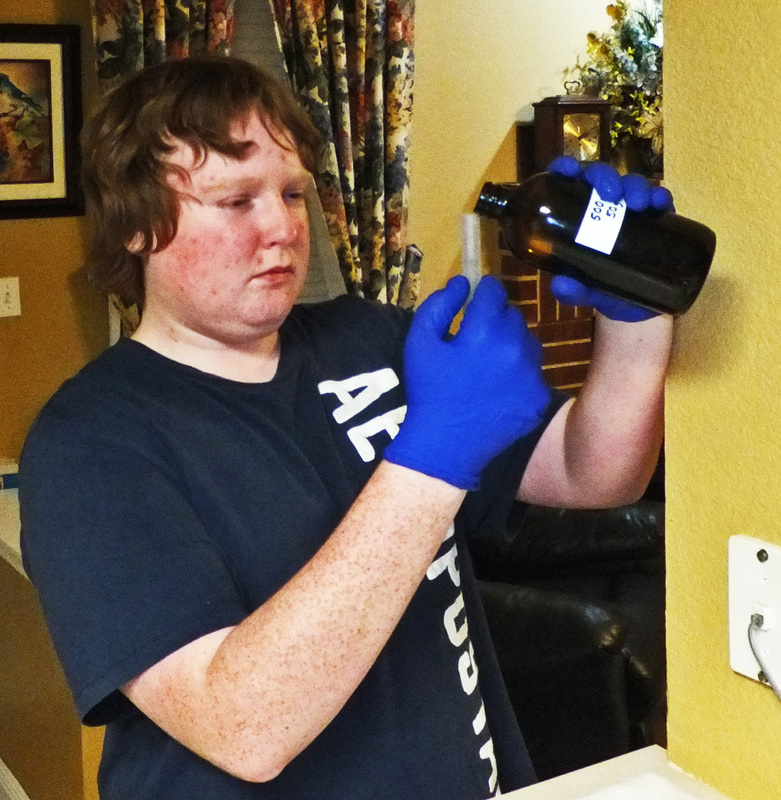 ¹Matt Elenniss, the principle investigator, is a 15-year-old high school freshman biology student in Cedar Park, Texas; Mr. Elenniss is responsible for designing and carrying out this study, and for compiling and publishing its results. ²Jerry Cates, EntomoBiotics Inc., Round Rock, Texas, served as mentor and advisor to the principle investigator conducting this study. Effects of Disodium Octaborate Tetrahydrate on the nematode Steinernema carpocapsae and its bacterial symbiont, Xenorhabdus nemtophila. As we know, nature tends to run on symbiotic relationships. A very famous and fascinating one would be the Nematode’s symbiotic relationship with its bacteria inside. 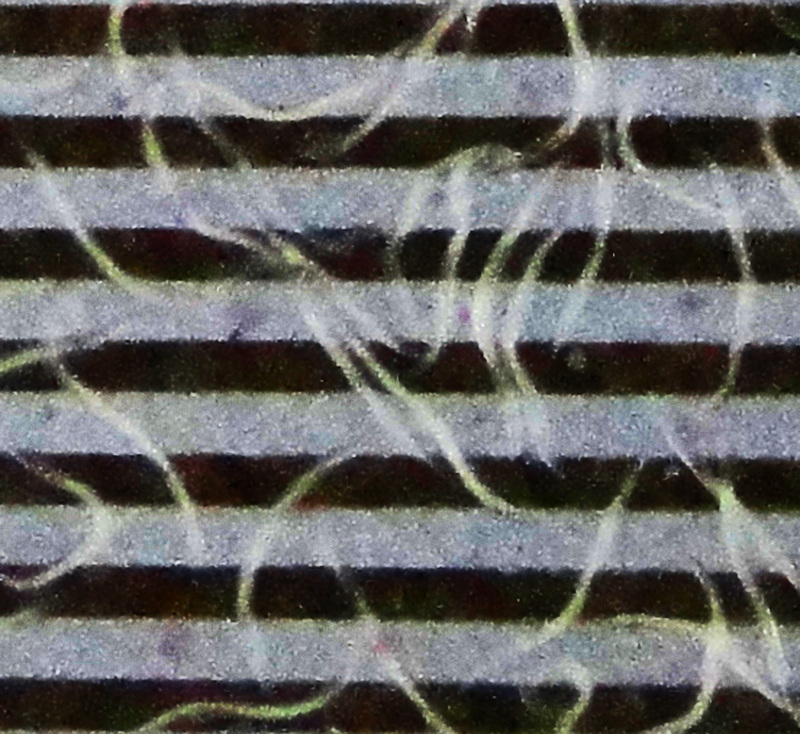 When the nematode affects its host, it will release its bacteria and an antibiotic. The bacteria kills the host (a worm, a termite, or any of a wide variety of insects susceptible to infections by EPN), while the antibiotic preserves the host from rotting. The nematode can then feed on the inside of the host and give birth to other nematodes. From there it leaves the host, and starts the whole cycle over again. 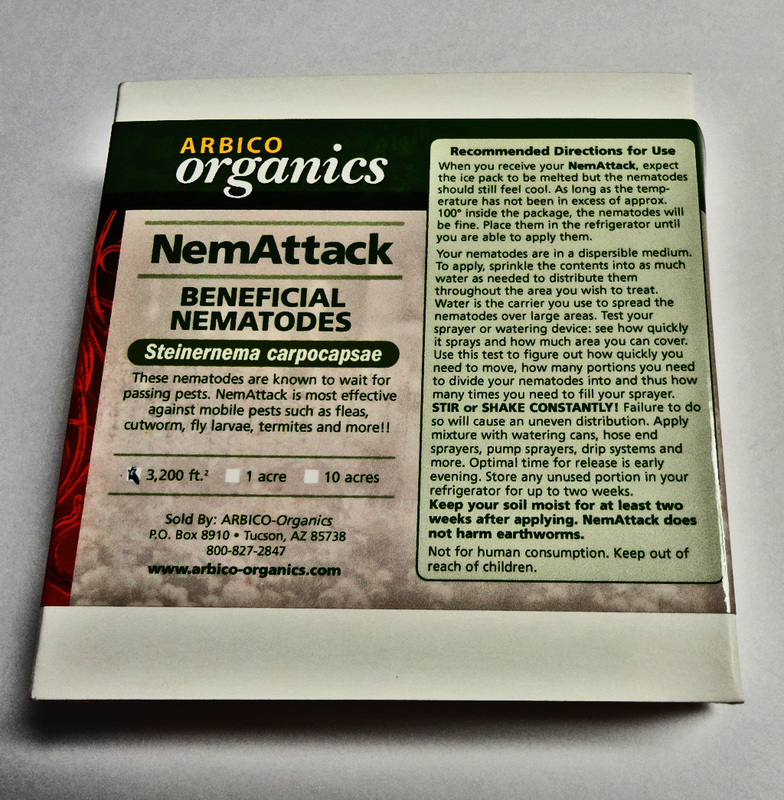 I began wondering, is there a way I can test how strong the bacteria in the nematode really is? The question my experiment focused on was this: Will Disodium Octaborate Tetrahydrate have any effect on the nematode’s ability to infect and kill its host by killing its bacterial symbiont? I predicted that on the 100% H2O (no DOT) the nematode will have the most effect, while the 10% DOT will kill the nematodes bacterial symbiont. My independent variable would be the number of hosts that die, and my dependent variable would be the amount of DOT I use. 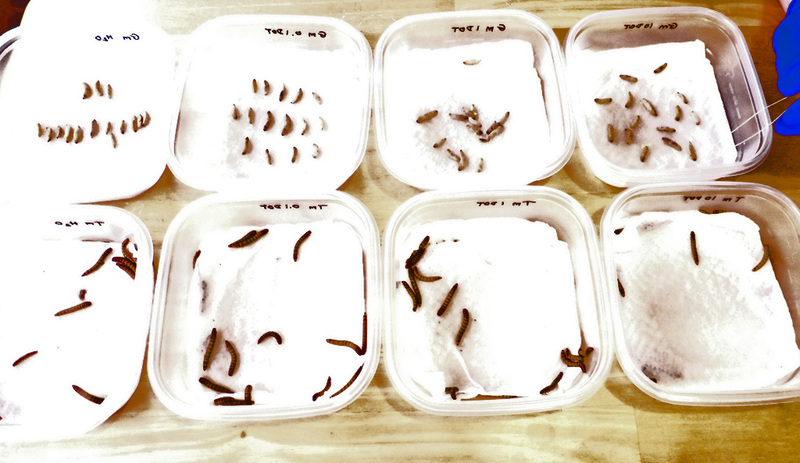 I used 8 plastic containers, Disodium Octaborate Tetrahydrate, nematode Steinernema carpocapsae, 72 wax worms, 71 meal worms, paper towels, and distilled water. 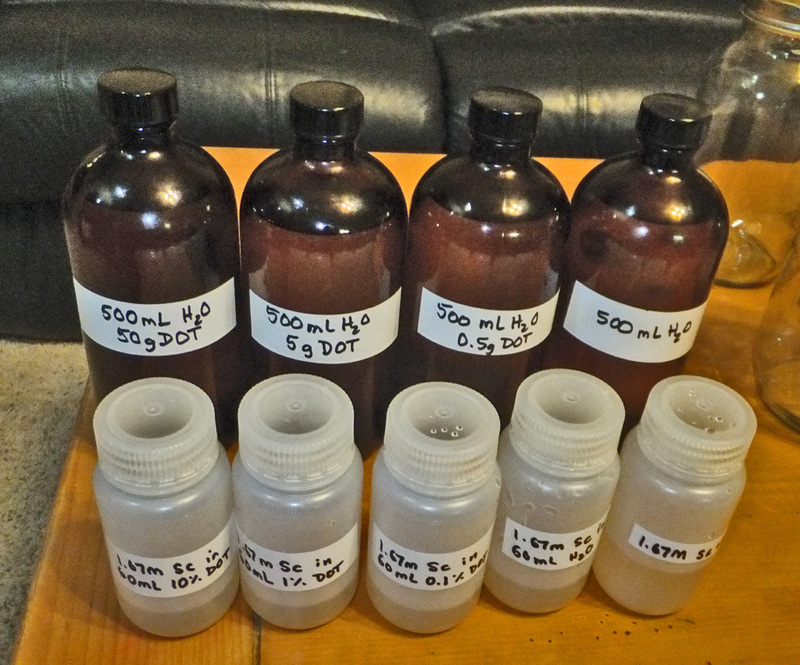 I took different amounts of DOT and I placed them in distilled water. Then, I had two groups of four containers. Two plain H2O, two .1% DOT, two 1% DOT, and two 10% DOT. 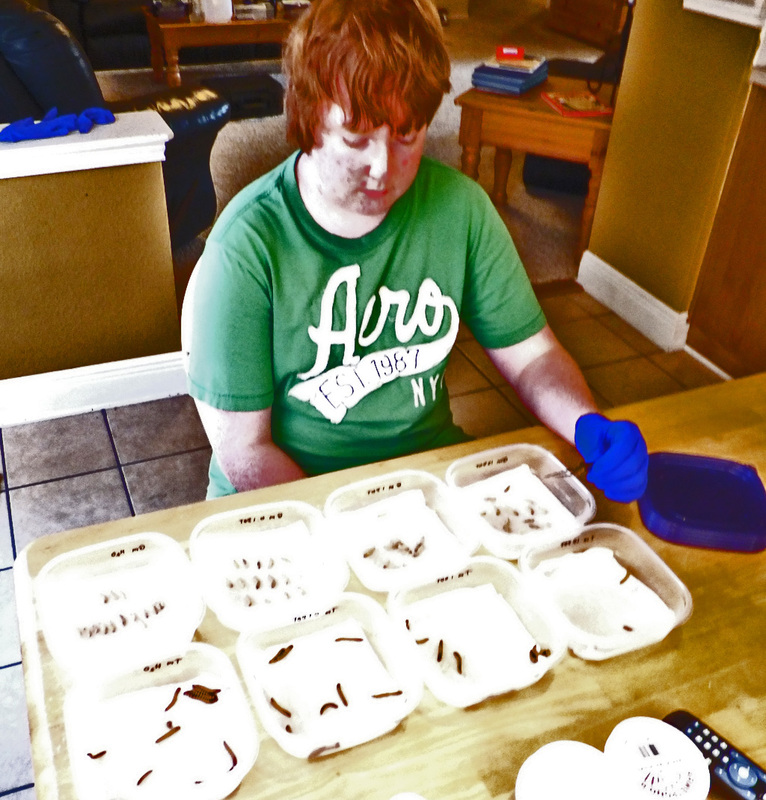 I then divided the worms equally between the containers. Wax worms and meal worms were kept separate. 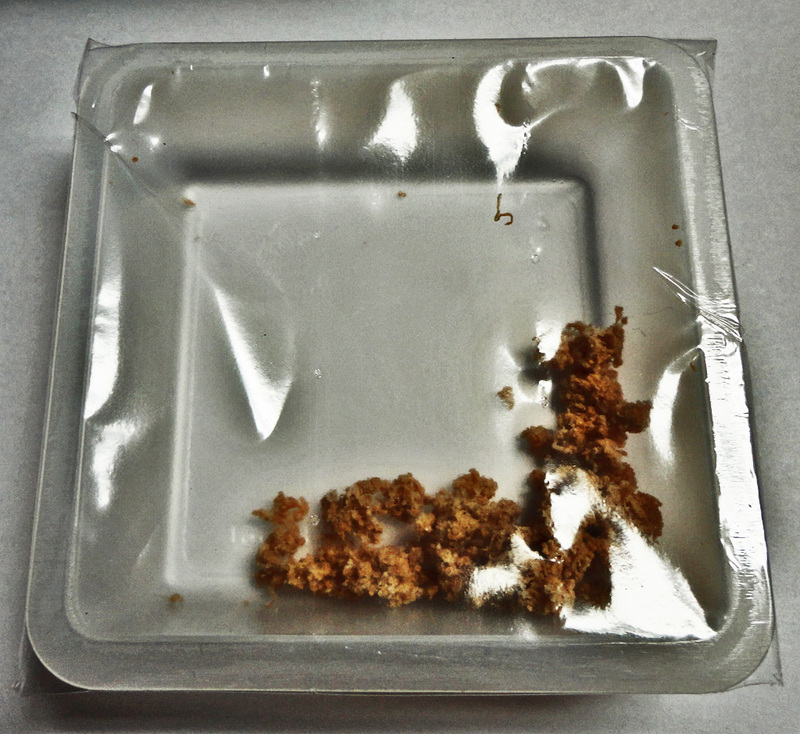 The base of the container was a paper towel that was soaked in the amount of DOT solution. I marked which was which with a sharpie on the container. My hypothesis was that the 10% DOT should not do very much harm to the nematodes. But it may have an effect on the nematode’s symbiotic relationship with the bacteria in the nematodes. However, the hypothesis did not turn out the way I had planned. As you can see in the graph, the 1% did the most damage to the nematodes. This was very interesting, as well as unexpected. H2O appears to be pretty even. After looking at these results, I will conclude that DOT has no (if anything a positive) affect on the nematodes. 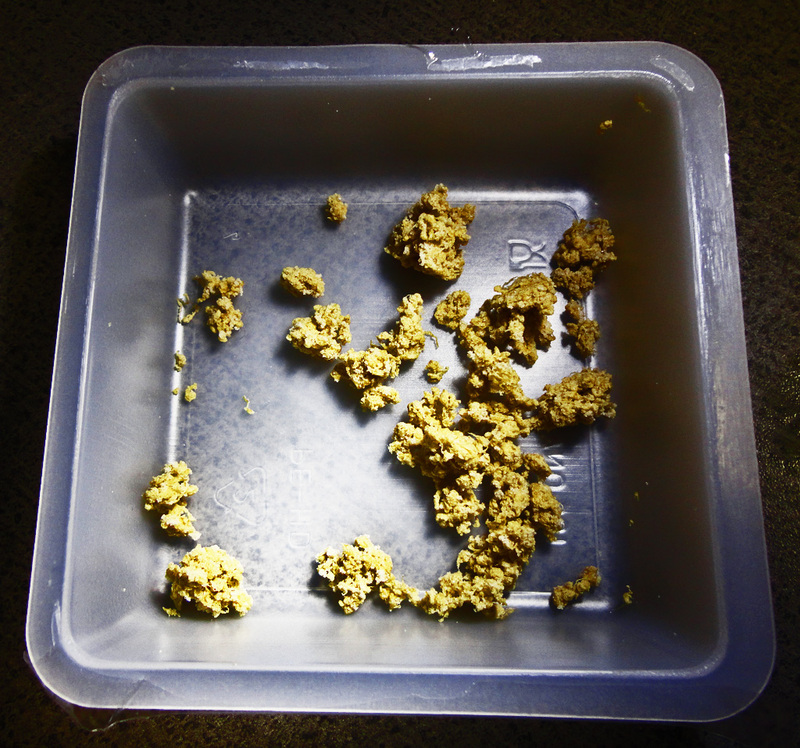 Based on much consideration, I have decided to exclude the results of the wax worms from the experiment. 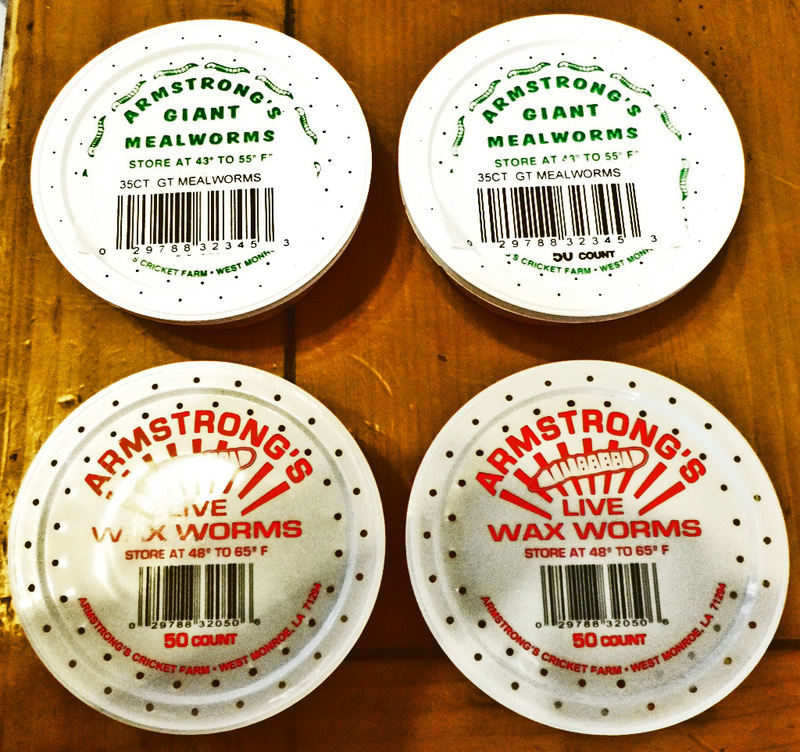 When I receive the wax worms, the moment I looked at them I knew something was wrong. None were moving, and/or looked healthy. My meal worms, however, had outstanding results and performance. It was practically impossible to tell the state of the wax worms, and I chose not to let that affect my scientific results. 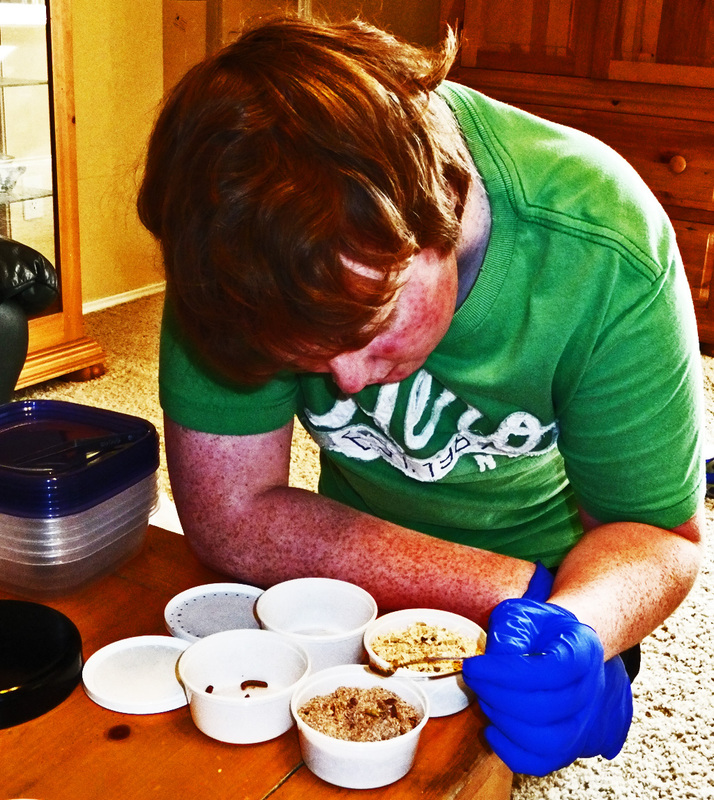 If I could do the experiment over again and fix something, I would definitely not use wax worms. I would select either a different type of worm, or just use meal worms. For future research, I would suggest conducting an experiment on why the 1% did the most damage. I answered the hypothesis, but the reason of the 1% remains a mystery. In future research I would suggest adding a container of mealworms without any nematodes added, to allow you to see the expected life range. My control group of this experiment was the H2O with no DOT, but I feel that I needed to add another. This concludes my experiment. Special thanks to Biologist Professor Lee Brown, and entomologist Jerry Cates for providing me with the tools and information so I could conduct this experiment. Matt’s mother, Debbie, completed her undergraduate studies at Baylor, and received her masters degree from the University of Texas, my daughter-in-law’s alma mater. These two Longhorns became acquainted, through a church both attended, not long after Alice and our oldest son were married. Over the ensuing years we’ve gotten to know Debbie and her family so well that we consider them part of our family. When, in the fall of 2011, Matt asked if I would advise him on an upcoming biology project, I was eager to help. Besides the obvious neo-familial ties, it dovetailed with a process that had been set in motion a few months earlier. 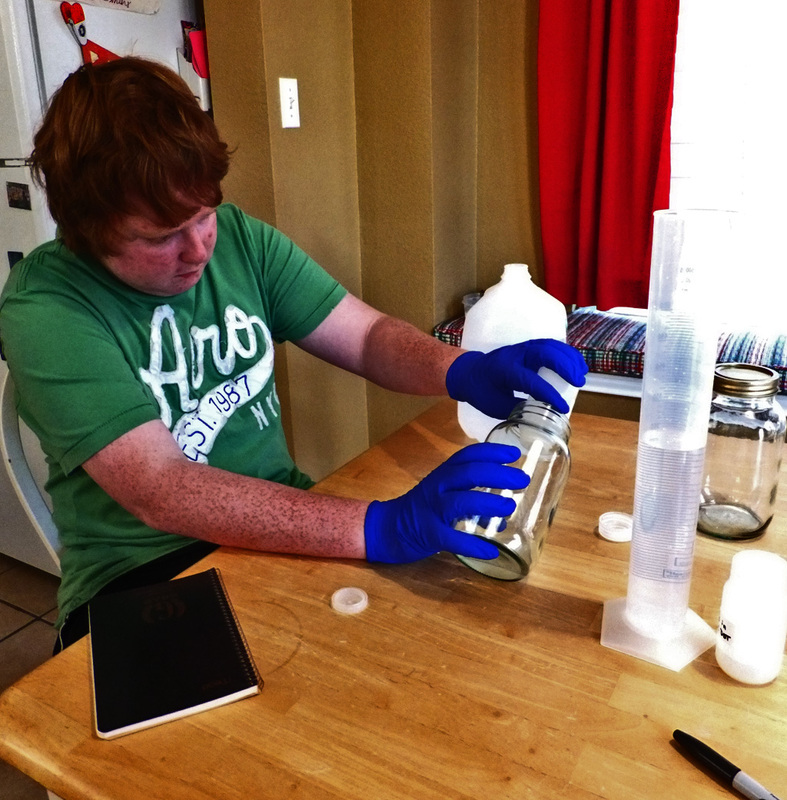 The Megatherium Society, which was founded early that year, was conceived as a vehicle through which young scientists might conduct and publish their own biological studies. Though these students of nature would need encouragement and assistance of various kinds, history shows that youth is no barrier to genuine scientific accomplishment. On the other hand, not having a venue through which to publish their findings could slow things down, as could a lack of encouragement and direction from older, more experienced individuals familiar with scientific methodology. Memories of my own experiences, as a young boy growing up in the 1940’s and 1950’s, are tinged with a number of regrets and frustrations. I regret, for one thing, not conducting a systematic analysis of the natural world around me and documenting, on paper, the simple truths — the observations — I witnessed. That’s what scientific progress is made of; not just the observing of nature, but recording those observations for posterity. Like most youngsters, I explored my surroundings with great interest, and everywhere were found organisms of which I had little or no knowledge. If someone had encouraged me, back then, to systematically document what I noticed about some of those organisms — like, for example, the gradual development of the yellow garden spider (Argiope aurantia Lucas 1833) — I would likely have done so, accruing much intellectual profit in the process. A small project of that nature would have spurred me on to more challenging ones, and who knows where that would have led? Surprisingly, even rather simple analyses of natural phenomena, when described in a truthful, systematic way, produce useable information that expands man’s scientific knowledge. Such is the case for Matt Elenniss in the project discussed here. And such would have been the case for me back in the 1940’s and 1950’s had I spent some of my “nature study” documenting the natural world about me. But I did not, though I remember vividly having the desire to do so, and feeling the bitter sense of frustration that came from knowing that the adults in my life viewed my scientific interests with disdain. In those days, at least in the home and community environment in which I lived (a military family, with mostly military friends, associates, and their family members), the acceptance of a clear dichotomy between minors and adults was unquestioned. Persons under the age of minority did not garner much respect from their elders, and were not accorded undeniable rights to their own views, opinions, or even — in many cases, including my own — their own material possessions. It seems strange, today, that such could have been the case, but it was. The civil rights movement of the mid-to-late-1960’s came about during my early adulthood. Sadly, the lessons it taught came too late to benefit my own children, who suffered much as I did because their father still adhered to a set of rock-solid — but wrong — attitudes formed from his childhood. Those lessons were not lost on them, however, which is thankfully evident in the way each is raising their families. I watch that play out, and it seems so natural. The profound influences of that movement on modern mores are so deeply ingrained into today’s culture that we often forget how things were before it took place. One of the most important influences has been the emergence of a generalized view that young people are worthy of the same respect as adults. This view is not new. It has always existed somewhere. But only in a few enlightened families. Where practiced, it was usually accompanied by gratifying results. For example, the household of young Eugène Simon (1848 – 1924), the celebrated French arachnologist, nurtured his youthful talents so well that, by age 16, he was already an accomplished taxonomist. Similar examples abound. Young scientists, both men and women, are eager to learn and explore new paths and novel ideas. Ideally, the adults in their midsts provide applause when things go right, and sympathy combined with encouragement to press on when challenges appear to block their way. Such an environment would have spurred me on at an early age. Of course, my first trials would have been quite primitive, flawed by unwarranted conclusions, and documented crudely (many of the taxonomical names created by Simon while in his teens have today’s scientists scratching their heads, though — by convention — his youthful taxonomical designations remain an indelible artifact of scientific history that cannot be changed). I would have guessed wrongly much of the time, only to discover, as more facts accumulated, the follies of projecting beyond my meager understandings. But that is the stuff of which learning is made. Mistakes are the foundation for all great achievements. The errors we make in our youth prepare us intellectually to accept the rigors necessary to reach new heights. That fact, alone, is sufficient cause to move the Megatherium Society onward in its quest to help young scientists get their feet wet — early and often — in the vast ocean of scientific exploration that lies before them. Working with Matt on this project constituted the first such project undertaken by the Megatherium Society. As such it, too, was fated with errors and omissions. Here I reference mine, not Matt’s. He was the guinea pig, thus also the victim, of my lack of experience in providing the kind of assistance young scientists need most. And so, it is mostly my failings that must be confronted in this review, rather than those that might be ascribed to Matt. A summary will be described here as time permits. Following that, the results of this experiment, as I understand them, will be provided, along with a revised set of experiments that will soon follow as a means of capitalizing on those results. The reduced risk pesticide disodium octaborate tetrahydrate is one of the most valuable and effective agents of termite control and prevention known to mankind. 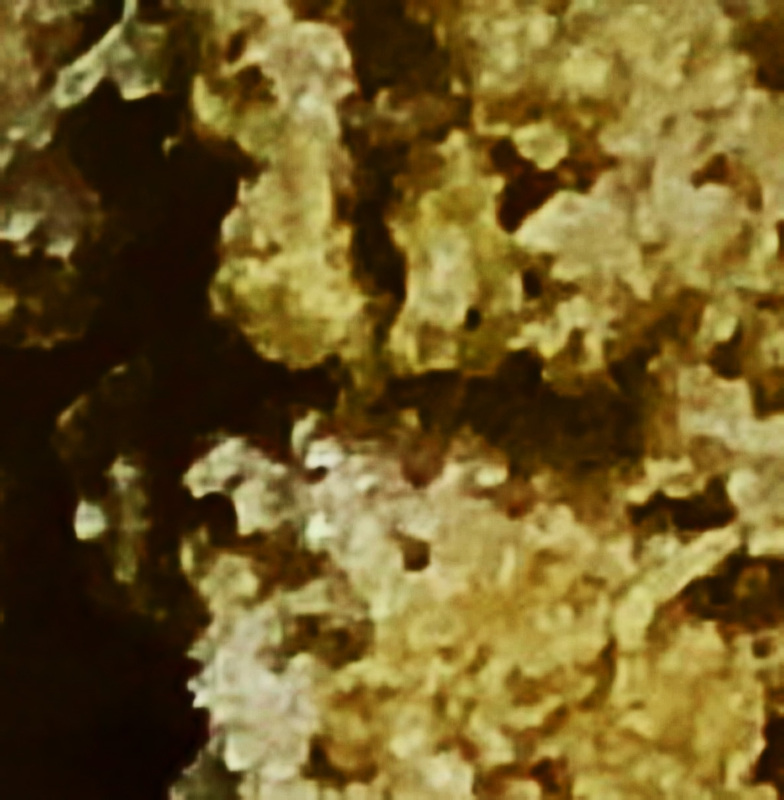 In addition, entomopathogenic nematodes such as Steinernema carpocapsae have been shown to provide a highly effective means of eliminating soil-based colonies of subterranean termites, including all species of termites native to North America and the introduced — and much feared — Formosan subterranean termite. It was natural to question if these agents played well together. The scientific study reported here suggests strongly that they do, and hints at the possibility that they combine their termiticidal effects synergistically. — Questions? Corrections? Comments? BUG ME RIGHT NOW! Feel free to e-mail your comments to jerry.cates@bugsinthenews.info. You may also register, log in, and leave a detailed comment in the space provided below.